Home › BLOG › Be Careful Out There! Summer brings runners and walkers out of hibernation. But as the trails and streets fill up with folks looking to get fit, the number of questionable characters increases as well. By staying alert and adhering to a few simple rules, we can limit unsafe situations and make our training as enjoyable as a hot humid run can be. As Sergeant Esterhaus used to say on Hill Street Blues, "Let's be careful out there." Stay Alert – We find ourselves in bad situations when we become complacent and oblivious to what's going on around us. We need to be aware of our surroundings. That means no headphones—or at least keep one ear free to hear cars, bikes, and people that may be approaching from out of eyesight. Be especially cautious in areas with poor lighting, which can make footing precarious and/or hide someone with bad intentions. Be Noticed - Make sure you are visible. 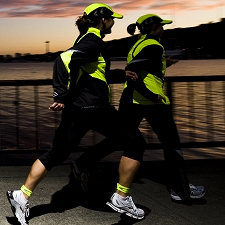 If you are running in the dark (early morning or at night), wear something bright and reflective. It’s also good to have some way to be heard. You want the ability to be loud and make noise. Lastly, have a way to contact someone should you need help. Making running with your cell phone a priority. Group It Up - Running with a group is a fun and safe way to get out the door and get the miles in. Not only are groups motivating, but they are one of the best ways to stay safe while training. As the saying goes, "There is safety in numbers." A group can help deter miscreants and provide a support system should you have a bad run or experience an injury. Training with a group is safer and more fun. Share - Let someone know where you're going and how long you plan on being gone. If you get lost on a run, or roll your ankle, or lock your keys in the car, someone will likely come looking for you if you're gone for much longer than expected. It may seem like a small thing, but having someone “in the know” can be invaluable in the event that something (big or small) goes awry. Be Prepared - Know your route and where you're going; getting lost is never fun. And know what you’ll do if someone were to approach you. You can’t always just run away, especially if you’re surprised by an attack. A self-defense class is an excellent way to prepare yourself to handle a dangerous situation. Don’t wear headphones. Use your ears to be aware of your surroundings. Your ears may help you avoid dangers your eyes may miss during evening or early morning runs. Run against traffic so you can observe approaching automobiles. By facing on-coming traffic, you may be able to react quicker than if it is behind you. Look both ways before crossing. Be sure the driver of a car acknowledges your right-of-way before crossing in front of a vehicle. Obey traffic signals. Carry identification or write your name, phone number, and blood type on the inside sole of your running shoe. Include any medical information. Always stay alert and aware of what’s going on around you. The more aware you are, the less vulnerable you are. Carry a cell phone or change for a phone call. Know the locations of public phones along your regular route. Trust your intuition about a person or an area. React on your intuition and avoid a person or situation if you’re unsure. If something tells you a situation is not “right”, it isn’t. Alter or vary your running route pattern; run in familiar areas if possible. In unfamiliar areas, such as while traveling, contact a local RRCA club or running store. Know where open businesses or stores are located in case of emergency. Run with a partner. Run with a dog. Write down or leave word of the direction of your run. Tell friends and family of your favorite running routes. Avoid unpopulated areas, deserted streets, and overgrown trails. Avoid unlit areas, especially at night. Run clear of parked cars or bushes. Ignore verbal harassment and do not verbally harass others. Use discretion in acknowledging strangers. Look directly at others and be observant, but keep your distance and keep moving. Wear reflective material if you must run before dawn or after dark. Avoid running on the street when it is dark. Practice memorizing license tags or identifying characteristics of strangers. Carry a noisemaker. Get training in self-defense. When using multi-use trails, follow the rules of the road. If you alter your direction, look over your should before crossing the trail to avoid a potential collision with an oncoming cyclist or passing runner. Call police immediately if something happens to you or someone else, or you notice anyone out of the ordinary. It is important to report incidents immediately. Now get out there and enjoy running safely! Good Luck and Happy Racing!